SEDA's new T-REC is the innovative and well thought through answer to quickly and easily separate tires from wheel rims. 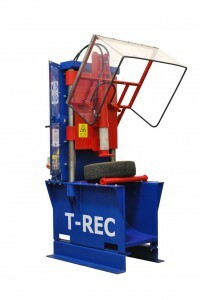 T-REC stands for Tire-Recycling and that is what you will do easily with T-REC help. A simple and uncomplicated way to separate tires from rims fast was the motivation for building the new SEDA T-REC. Incorporating ingenious time saving and safety features not seen anywhere else ensures that the SEDA T-REC quickly established itself as the number one solution for tire separating technologies. Quick-adjustment system – tire dimension from 13" to 17"
With its unique quick adjustment system the SEDA T-REC can separate tires from all sizes of rims, steel and alloys up to a maximum size of 17 inch´s. Safety comes first at SEDA which is why our Tire separator incorporates a sturdy piercing device to deflate the tire and hold it in place while the sturdy hydraulic unit pushes the rim down and away from the tire. T-REC to be the fastest tire separator in town. Unique features and a powerful hydraulic system means a cycle time of only 15-20 seconds.